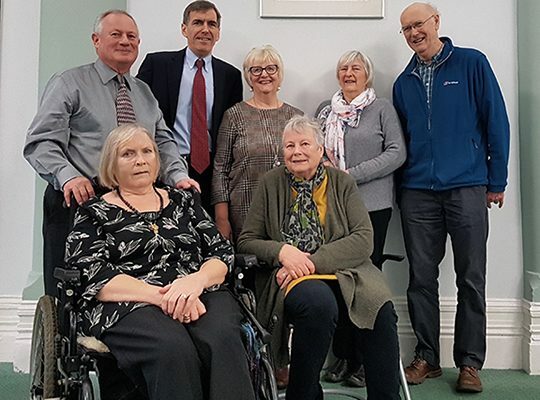 Macclesfield MP, David Rutley, is working alongside local Parkinson’s patients, their families and carers, supporting their action to retain a dedicated Parkinson’s nurse service in Eastern Cheshire. This issue has arisen following the resignation of the previous nurse – and East Cheshire NHS Trust withdrawing from delivery of the service. David met with local Parkinson’s patients, and the Parkinson’s UK co-ordinator for Cheshire and Merseyside, Marion Rogers, at a specially-arranged meeting, who emphasised their strong concerns, which David shares, about the potential loss of the Parkinson’s community nursing service in Eastern Cheshire, which is currently provided by East Cheshire NHS Trust.They explained that Parkinson’s nurses play a vital role within the local Parkinson’s community, helping to significantly reduce the number of unplanned hospital admissions, and providing invaluable information, advice and emotional support provided to local patients and their carers, on day-to-day concerns about issues such as managing medication. David pledged his support to seeing the Parkinson’s nurse service being retained and delivered locally. At the meeting with Parkinson’s UK, it was emphasised to David that Parkinson’s patients in Eastern Cheshire rely on being able to access a local nurse, who is able to contact doctors and clinicians within the local health economy. In addition, the existing consultant service, also bought in from Salford Royal, has a limited number of appointments. With over 450 people in Eastern Cheshire living with Parkinson’s, it is vital that they can access specialist advice and support, when they need it. Next Story → Calling Junior Rangers!